Kangaatsiaq means "the little promontory". 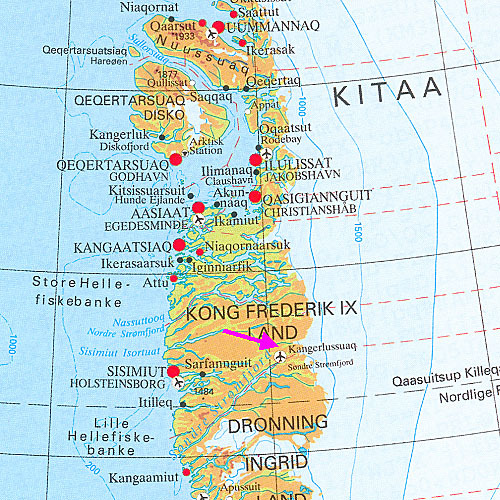 The town is Greenland's youngest, and only received the status of a town in 1986, but the settlement is of course much older. Kangaatsiaq is an unspoilt little town without large hotels or tourist offices – in fact only private accommodation and an internet café. Here amongst the many colored houses, you can drop a line to friends and family and tell the story of an authentic and almost untouched town in Greenland. Thousands of musk oxen live in the mountains around town, and a dirt road connects directly with the ice cap for an half day guided drive. East of Kangaatsiaq a 150 km (95 mile) large fjord system opens up with countless islands, coves and bays, and there are good opportunities to explore the protected waters by boat, canoe or sea kayak. There are plenty of opportunities to see the wildlife en route, including reindeer, fox and hare as well as many different species of bird. The sea around Kangaatsiaq is the natural habitat for many species of Greenland's sea mammals such as Greenland seals, humpback whales and minke whales.